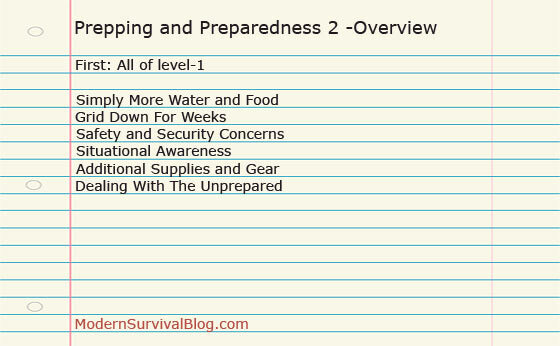 “Prepping and Preparedness 2” is a level of being prepared for 1-month. Level-2 builds upon the topics discussed in Level-1 and I will not be repeating those details with the exception of expanding the topics where necessary. That said, there are a few additional preparedness topics that I will include here because the presumption of being prepared for up to 1-month implies that the disaster event is more serious and requires additional thinking and preparation. If you have met the requirements to graduate from level-1, chances are that you’re interested to go further now that you’ve established a baseline. Prepping and preparedness is rather contagious in that as you achieve more personal readiness, you start to feel more independent, confident, and liberated. It’s a good feeling! So lets get going and make it to the next level! To increase water and food storage from 1-week to 1-month is mostly and simply acquiring more. Water storage for 1-month becomes more of a challenge due to the quantity and weight, however I will point out some options to deal with this along with recommendations for additional food. Especially in urban environments, your personal and home security will likely become a very big concern if we’re looking at weeks without electricity. If we look at what happened during the weeks after Katrina for example, the bad elements of society took advantage where they dared. Remember this: As people become more desperate they tend to do desperate things. So this general topic requires more detail which I will be discussing. This is a new topic here in level-2. Your personal awareness of what’s going on around you should be high during any disaster event. Conditions may be about to change or in the process of changing around you, and you will need to be aware. There are also going to be a LOT of unprepared people around you trying to deal with the event (assuming it’s an event beyond your own personal event) so your senses better be tuned-in to what’s happening. I will explain further details and situational awareness tips in related articles. There are additional supplies and gear that may help get you through a lengthy event. While it’s pretty tough to prepare for “everything”, I will offer suggestions for some additional things that may be helpful. This also is a new topic in level-2. If the event has affected your region beyond 1-week, there are going to be a lot of unprepared and unhappy people who will reach a whole new level of “inconvenienced”. Some of them may knock on your door. Some of them will be your neighbors. I will discuss several ways to deal with this along with my own personal recommendations. As I write more “Prepping and Preparedness 2” articles related to the specific topics mentioned above, I will link them. In the mean time, you will find lots of helpful information buried in the blog. Check out our Categories page and make use of the Search function too. Grid down will be based on your needs at the time. I run a genny in the winter if I lose power but that only lasts till the fuel is gone. I heat with wood so cold in the winter won’t matter and since I am in the mountains heat in the summer isn’t a problem either. I recommend getting solar lanterns for lighting in the home at night. there are many led ones that will last a long time on a charge. Small ones with motion detector are in the bathrooms and closets so they just come on as you either open the doors or walk into the rooms. You can use battery operated ones also but you start running into the same fuel problem unless you can recharge the battery’s which means you are back to solar. Having the skill and ability to can and dehydrate is also a must IMHO. I have 40-80 lbs of meat in my freezer at any given time and that would be a complete waste of food if it couldn’t be preserved if the power went away . I hear the term “Grid Down” a lot but never a detailed description of what exactly that means. It is most commonly used generically and implies something that may or may not fully exist. “Grid Down” has multiple elements and each successive element added only makes it worse or more or less more problematic depending on which elements are down, therefore more or less more difficult to endure. It’s easy to become complacent if you have never experienced a total catastrophic grid down, but only a grid down with one or two elements down. Do not become complacent by thinking generically… think of all the elements. You should prepare for each accordingly. A disruption of all the elements simultaneously along with critical infrastructure collapse (bridges, rail service or major highways out) over the term of the preparedness level would affect your preparedness and thus your ability to survive or simply endure miserable conditions. Prepare accordingly. For example, I have experienced “Grid Down” scenarios with the total loss of power for up to six weeks and a partial loss of communications intermittently over the same period. We still had gas and water service and transportation. Food and water is a non issue with me but it was available for everyone after a week or less. A loss of each successive element compounds the problem. Prepare accordingly. Hurricane Katrina was a major catastrophic grid down event for New Orleans and surrounding area. Hurricane Sandy was also a major grid down event for the North East area. Events that destroy homes and infrastructure are catastrophic grid down events. Prepare accordingly. Regardless of your levels of preparedness (1 through 4), you should keep in mind all the elements of “Grid Down”. It’s a lot easier to endure with just one or two elements down than it is to live under a bridge somewhere because the total infrastructure was destroyed, including your home. Just saying. I have updated the article to reflect “electrical grid down” (which was my intent with this particular article), thanks. I agree with your analyze of a ‘Grid Down’ event. I would guess that most believe a ‘Grid Down’ has only to do with Electrical Grid, but honestly take any one or more of your ‘elements’ and the masses will still go NUTS!!!! As an example take away Garbage Collection in the major cities like what happen in NY called “The Great Garbage Strike of 1968” whereas there was no collection for 9 days, there were literally MOUNTAINS of garbage in the streets. Can ya just imagine the country if JIT inventory collapsed even for just 2 weeks? The streets would be a War Zone. It would take MONTHS for the stores to recover. As for “grid down” imagine a major New Madrid earthquake distroying all or most of the bridges on the Mississippi River. East coast cut off from the rest up the country. Much of the food and probably the oil and gas pipeline cut. People would soon have little to eat as now most food growing is out west . Stock deep and high,food and ammo we may need both. I thought Florida & Georgia were states that grew food like fruit & potatoes. South Carolina grows sweet potatoes & North Carolina farmers have pigs & Cows. And lets not forget North Carolina has wineries & Kentucky the Whiskey. So the southern part of the east coast wouldn’t have a problem. Pretty sure the Northern states have crops too.